Consideration is the way in which you and your shareholders will get paid. The most common way to get paid is cash. The other common way to get paid is in the buyer’s stock. You may also get paid by accepting a note (an IOU) from the buyer. And of course, many transactions include more than one form of consideration. 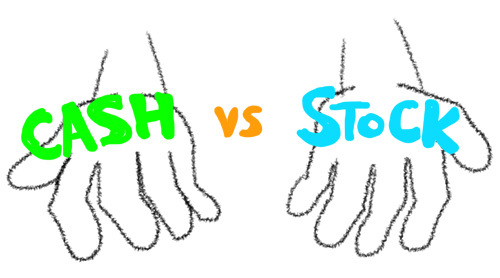 A combination of cash and stock is very common. Cash is the best way to get paid in most cases. You know exactly what you are getting when you get paid in cash. If the purchase price is a signficant amount of money to you and your shareholders, I would almost always prefer cash. If you’ve created a lot of wealth with your company, why risk that wealth on someone else’s company? Stock is the best way to get paid if you are selling your company relatively cheap but you are a big believer in the upside of the buyer’s stock. A good example of this are sales of young companies to fast growing privately held businesses. When Ev Williams sold Blogger to Google, the Blogger shareholders got privately held Google stock which appreciated a lot when it eventually went public. When Summize sold its twitter search service to Twitter, the Summize shareholders got Twitter stock (and some cash) and that Twitter stock has appreciated significantly since. In these kinds of transcations the Blogger and Summize shareholders would not have made much of a return if they had taken cash. By taking stock, they turned their company sales into fantastic transactions. There are situations where the buyer will require the seller to take stock. It might be because the buyer doesn’t have sufficient cash to make the purchase. Or it might be because the buyer wants the seller to be aligned with the buyer and incented to stick around. If you are accepting stock as consideration, you need to be careful to evaluate the short, medium, and long term potential of the buyer’s stock. Back during the first Internet bubble, we sold one of our portfolio companies for stock in another company. We did diligence on the buyer’s company and knew that it was weak and in trouble. But so was our portfolio company. Three months later, the buyer went under and we lost our entire investment. We probably would have ended up in the same place if we didn’t sell. But I tell this story so that you all understand that taking private stock can be risky. It is not an exit unless the stock is public and liquid and you can sell immediately and turn it into cash. Selling for public stock is a lot different than selling for private stock. Public stock is a lot closer to cash, particularly if there are no restrictions on the seller’s stock. If you get public stock with no restrictions, you can sell immediately and turn it into cash. Or you can hedge your stock with puts and calls and take a lot of the risk out of the position. Or you can put in place a regular selling program. If you are selling your company for public stock, pay a lot of attention to the restrictions the seller wants to put on your stock. And resist them as much as you can. Taking a note from the seller is not very attractive. A note has very little upside (compared to stock) and it is not immediate cash. With a note you are still taking risk that the purchaser could falter and not be able to pay the note. It is true that a note will not fluctuate with company performance like stock. If the purchaser remains in business and solvent, the note will be paid at face value with interest. We’ve received notes as consideration in a few situations over the years but it is very rare in the venture capital and startup business. As a matter of practice, I like to avoid them. In summary, you can get paid in multiple ways in an M&A transaction. Cash is usually best and is also the most common. Stock is attractive if you believe there is a lot of upside in the purchaser’s stock or if it is public and immediately liquid. A note is the least attractive form of consideration and also is rare in the venture capital and startup sector. Investors have a portfolio and welcome volatity. Entrepreneurs generally have all of their net worth in their own company. One of the most striking cases I’ve seen where investor and founder incentives diverge. Listen very, very, very carefully — VALUE SAVINGS CLAUSE. This tool will provide some considerable downside protection when crafting a deal with a seller who is offering, in part, stock. This is not some pie in the sky business school baloney, I have done it though folks fought me and it was not easy. Well, actually, it was easy because I was not wiling to compromise. A value savings clause typically stipulates that on an annual basis, the value of stock offered is valued and if the value comes up short, then the seller gets more stock. This is a balance drawn between the typical “lock up” and restrictions that a seller wants on their stock — they will not be enthusiastic about a buyer being able to just sell their stock the day after the closing — and the underlying risk of the securities delivered. Also, think about dividend paying stock. Done this also. It is a good thing. If you get stuck on a valuation issue on the overall transaction, a deal saver can be some warrants to acquire the buyer’s stock even when the warrants are modestly out of the money. This is not a different form of compensation than what Fred has outlined, it is a variation on the theme of taking stock. Last comment, think about a convertible promissory note that converts into a fixed number of shares thereby providing upside if the stock trends upward. This article was originally written by Fred Wilson on March 21, 2011 here.